Canal Street Art Gallery presents: NATURE’S DECONSTRUCTION, Paintings by MC NOYES & Sculptures by PHYLLIS ROSSER. The Duo Show will be on view to the public April 10th through May 11th. 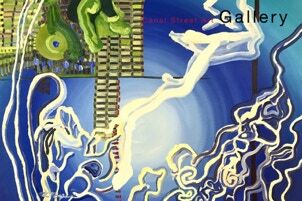 All are invited to attend the opening reception, on Bellows Falls 3rd Friday GALLERY NIGHT, April 19th from 5-8pm, to meet the artist’s and enjoy live jazz music. The Gallery is located at 23 Canal Street in the Historic Downtown Village of Bellows Falls, Vermont, and is open Wednesday through Saturday from 11:00am to 5:00pm. 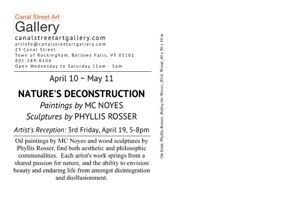 Oil paintings by MC Noyes and wood sculptures by Phyllis Rosser, find both aesthetic and philosophic commonalities in NATURE’S DECONSTRUCTION. Both artist’s work springs from a shared passion for nature, and the ability to envision beauty and enduring life from amongst disintegration and disillusionment. The life-size gestures and movements of both artist’s compositions mirror each other, using the shapes and textures of paint and wood to respectively accomplish their work. NATURE&apos;S DECONSTRUCTION offers the shared experience of these two artists working independently to create art to be appreciated for its aesthetic beauty, it’s deeply personal meaning and process to the artist, and their desire to share with the viewer a new life cycle, to be found in their art. Phyllis Rosser expresses an exuberance and passion for the natural world through her sculptures. The artist is fascinated with the beauty of disintegration, and the breaking down of our environment as nature continually reconstructs it. 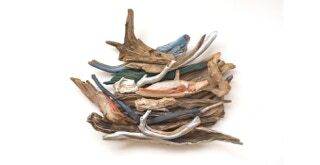 Finding an enduring energy in the wood collected over many years from the Connecticut River, tree limbs and branches as they break down through the actions of water and sun, Rosser constructs freestanding, wall, and ceiling hung sculptures. These sculptures show the infinite patterns of grain and broken forms of the wood, and reflect the natural compositions found along the banks of the river. 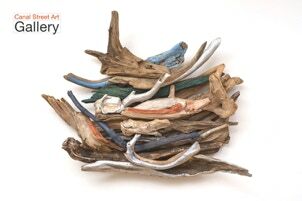 For the artist, this work represents a struggle for sensuousness by transforming and revaluing a material often considered refuse into objects that are appealing and alive. It presents not only the enduring aspect of nature but the unique beauty expressed through its vulnerability to the ravages of time. Oil paintings by MC Noyes in NATURE’S DECONSTRUCTION are part of the artist’s series Deconstructed Earth. This series for Noyes has been a decade-long pursuit of concepts through a personal process to find inspiration despite despair and disillusionment with humanities stewardship of this planet. Noyes paints each of these works with a particular concept in mind, working from memories of his observation and cataloging of satellite imagery focusing on the patterns and structures of modern human civilization, and the changing surface of this earth. Four concepts are presented in NATURE’S DECONSTRUCTION: Atmosphere, Water, Land, and Life. Atmosphere focuses on this element as a natural resource, and the effects of human colonization on it. Water is a vision of our water-centric civilization. Land is an investigation into the patterns of civilization created by humans on the land of this earth. Life is about seeing this planet as a single living being, a body, functioning to provide a way to hold water; without which there is no life. For more information about: “NATURE’S DECONSTRUCTION MC NOYES Paintings & PHYLLIS ROSSER Sculpture” or Canal Street Art Gallery; go to canalstreetartgallery.com online, call Mike or Emmett by phone at 802-289-0104, or send emails to artinfo@canalstreetartgallery.com.